Marriage Ceremonies performed at your location. It is always an honor and a privilege to perform a marriage ceremony. One of my favorite duties as a Notary Public. 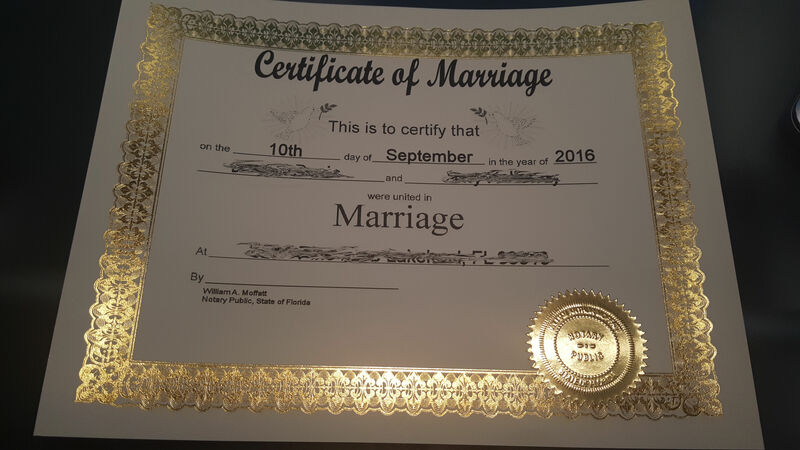 Florida is one of the few states that allow Notaries Public to perform or "solemnize" marriages within the state. As a Wedding Officiant I do solemnize marriages and my fee for this service is $40 which includes travel, preparation and wait time. Before a marriage can be solemnized, you must first obtain the required marriage license from the clerks office located in your closest Courthouse. You can obtain one from the county clerks office at their office in downtown Bartow. You can find out more information by visiting their website HERE. Both the groom and the bride must have valid photo ID to present along with the marriage license before a ceremony can be performed. I will come to your location and perform the ceremony. There are several options, rings, vows or no rings and just vows, I'm easy to work with and available on short notice. Additionally, I provide a gold embossed certificate of the marriage for you to keep and cherish. (see seal image to the right). This is included in my $40 fee! You may also see a sample certificate HERE. I am available days, evenings and weekends for your convenience. Call today at 863-698-3793 and lets get started.